The major appeal of living in a metropolitan city is that every imaginable amenity is close by and easily accessible. This is where the entire idea of the Sharing Economy comes into play and has become a trend in many different aspects of metropolitan life. The Shared Economy focuses on the ‘on-demand’ sharing of assets in a way that improves efficiency, sustainability and community. Usually coordinated via the internet, people can rent everything from beds to cars to boats and much more. Smartphones with GPS enabled also allow people see where the nearest rental can be found with online payment systems handling the billing. From November 2015 to October 2016, an estimated 9.5% of persons aged 18 and older living in Canada participated in the sharing economy by using peer-to-peer ride services or private accommodation services. Overall, spending on peer-to-peer ride services in Canada and spending on private accommodation services both in Canada and abroad totalled $1.31 billion. This post focuses on the shared economy in Vancouver and in particular any shared mobility services. Vancouver is a bit of a unicorn amongst North American cities because there are no ridehailing operators such as Uber and Lyft operating. Yet at the same time residents have access to more mobility options because there are a variety of shared mobility providers available, one of the best bike infrastructures and a fairly dense public transit system. So from a consumer perspective Vancouver is ripe for a more integrated system and Mobility as a Service is one option. In Vancouver, the average car sits parked for 95% of the time. One huge aspect of the “Sharing Economy” is its presence in the transportation sector. Carsharing allows the user the option to take transit, walk, cycle or to take a trip in one of the ‘on-demand’ vehicles within the fleet, when required. Currently, the City of Vancouver alone has over 3,300 carsharing vehicles. Car share services such as Car2Go, EVO, MODO and Zipcar offer vehicles that are available by the minute, hour and day and are located throughout Metro Vancouver, Whistler, Victoria, Kamloops and Kelowna. The services offer both “one-way drop off” and “return to a home location” options. Carshare vehicles can be parked free of charge in “permit-only” on-street parking throughout Metro Vancouver because the City enables carsharing through special paid parking permits. Several of the carshare operators have reserved spots at seven TransLink park and ride locations which is one way of integrating public transit with shared mobility offerings better. 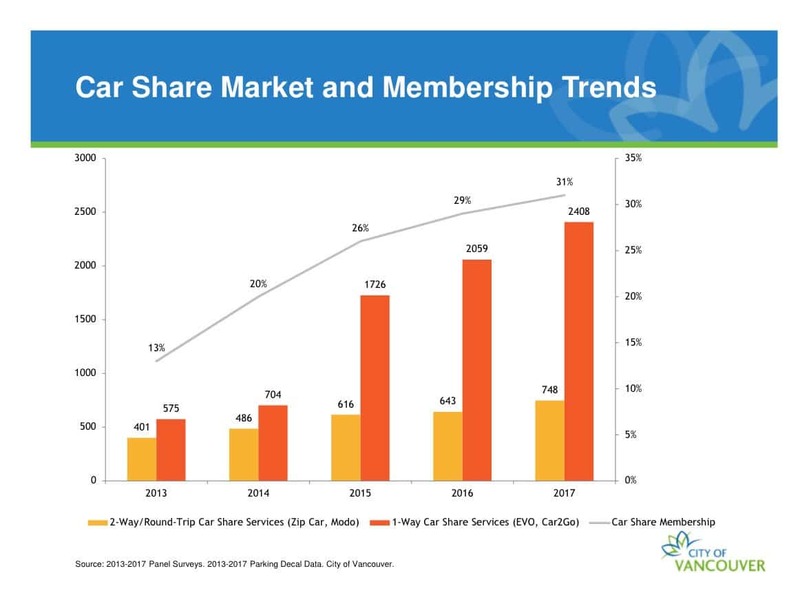 The carsharing eco-system certainly has attracted a lot of members in Vancouver: According to the latest statistics from the City of Vancouver 31% of the population uses one or more carsharing service, that is more than 200,000 people. Money saved on car costs, parking, insurance and maintenance – AAA estimates that the average car costs over $700 per month to own. 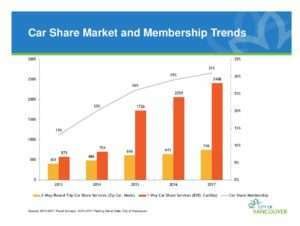 Carsharing averages about $100 according to a member survey of Zipcar. Reduces the number of vehicles on the road – Research shows that each carshare vehicle takes 15 personally-owned vehicles off the road. This frees up valuable space, especially in dense cities like Vancouver. Reduces carbon emissions – Car sharers travel less, help ease traffic congestion and reduce the need for more parking. This behaviour change is a result of clearly understanding the cost of the trip. Ride-hailing is another popular means of transport within the “Sharing Economy”. Uber and Lyft are the ride-hail giants in the industry, with 86% of people who use ride-hailing apps using Uber and 32% using Lyft. As mentioned earlier there is no legal framework for ride-hailing services to operate with the province of British Columbia. Earlier this year the RCMP cracked down on several app platforms in Metro Vancouver that were in use by both drivers and consumers. As the government of British Columbia considers the impact of allowing ride-hail apps to operate legally within the province, there are looking at the benefits of the services in other Canadian provinces, such Alberta or Ontario. Calgary now offers a predominantly female ride hail service, Pink Car that aims to improve transportation options, for not only women, but for seniors and people with special needs in Calgary, Cochrane and Airdrie. Innisfil is a small community south of Barrie. A year ago last month, the town partnered with Uber to launch Canada’s first door-to-door, ride sharing-transit partnership. The town pays a subsidy for every Uber car trip taken by residents and has stipulated that no Uber surcharges are charged. Depending on how and where ridehailing is implemented, they can improve the overall transportation equity across the country. While ride hailing isn’t a legal option just yet for the citizens of British Columbia, ridesharing certainly is. Services already exist and are functioning across the entire province, such as formal carpooling options. These online services allow you to register as a driver or passenger for free, such as Poparide and Spare Rides. With these services, you can get picked up from your doorstep and driven to work and home again, by your co-workers living in the area.Ride-sharing is essentially an app enabled hitchhiking service. Prices for these services can be as affordable as taking public transit. Reduced congestion because ride-sharing encourages people to share rides, the number of trips are taken in single occupancy vehicles is reduced. In a recent blog post, we discussed non-traditional methods of shared mobility within urban environments: micro vehicles. Micro mobility refers to vehicles that are an alternative to current, traditional modes of transportation. Micro vehicles include e-scooters, e-bikes, segways and small electric cars, with maybe one or two seats. Bike sharing is widely popular across the province with services like U-Bicycle offering dockless biking option in Victoria and and Mobi, the Vancouver bike share program. The list continues to grow and includes VeloMetro, who launched a fleet of electric-assisted, three-wheeled velomobiles for public use at the University of British Columbia in February. MaaS – FUTURE OF BC TRANSPORTATION? As growth of urban areas continues to climb, the influx of people will put a serious strain on city transportation requirements. Traffic congestion will increase, as will the need for public transit at peak hours throughout the day and the amount of parking spots will inevitably decrease. What if all transportation was converged and tailored to your specific travel needs and requirements? Mobility-as-a-Service (MaaS) will integrate technology on public transit, connecting journeys on either side through, for example, an app on your smartphone. One app for all: Instead of registering and providing your personal and payment details with several different providers, you have one app that handles all of that. Accurate departure and arrival times: It can be difficult to determine your on-time arrival when calculating various dis-integrated forms of transportation; the app will quickly calculate and provide accurate departure and arrival times for you. Per trip pricing: Each trip from start to finish will be condensed into one price, giving the user an accurate idea of the entire cost of their commuting journey. Easy payments: Instead of fumbling in your wallet for your metro card or searching for coins, you will be billed at the end of each month via your app which is connected to your credit card. Compared to many cities, globally, the transportation industry in British Columbia is both more advanced and developed, but its future relies heavily on integration between different sectors within the industry. Trains, buses and ferry services all need to work as one system that will work side-by-side with any other shared mobility app. This connectivity will allow for a more inclusive, efficient and environmentally friendly future. On June 13th, 2018, international mobility leaders and professionals will be attending the CUTA’s New Mobility Symposium in Vancouver, British Columbia. Public transit underpins the framework for livable, efficient and healthy communities. CUTA members aim to advance public transit and integrated urban mobility across Canada. Points addressed in this blog post such as MaaS and ridehailing in BC will be hot topics at the symposium. As technology develops and evolves so must the mobility landscape. We will be at this year’s CUTA New Mobility Symposium taking place in Vancouver on June 13th 2018. You can get 15% off tickets using code ‘movmi.’ Register here and connect with us here or at the event.